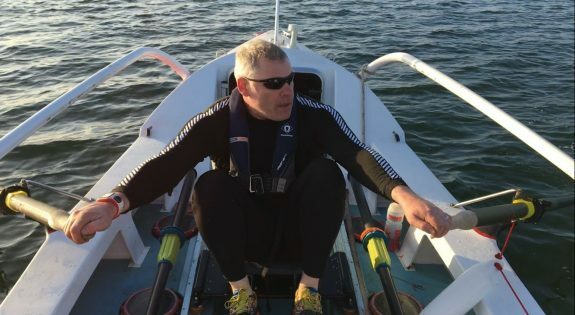 A former soldier from Northamptonshire is to row across the Atlantic Ocean to raise money for the British Army’s national charity. Alan Bustin-Mulkern, who is an adult volunteer with Leicestershire, Northamptonshire and Rutland Army Cadet Force (LNR ACF), is hoping to raise £100,000 for the Army Benevolent Fund (ABF – The Soldiers’ Charity) by taking part in the 2017 Talisker Whiskey Atlantic Challenge. It involves the 47-year-old from Northampton rowing 3,000 nautical miles from San Sebastian in the Canary Islands, Spain, to Nelson’s Dockyard in Antigua. The former member of 4/73 Battery, 5th Regiment Royal Artillery has set up the Row West 2017 team for the event which starts on December 12 though is unsure if he will take on the challenge solo or with a partner. Alan said: “The Atlantic Challenge is something I’ve wanted to do since I saw James Cracknell and Ben Fogle take it on in 2005/2006 – it’s a fairly unique, niche type of activity but is everything that a real adventure should be. Practical, emotional, technical and remorselessly physical. Alan only took up rowing last year and will need an estimated 1.5 million oar strokes to propel the 10 metre vessel with sleeping cabin across the Atlantic. He’s currently receiving nutrition and psychology advice as well as fitness training from Northampton University in a bid to complete the feat. Alan explained: “While I’ve never done anything on this scale before, I have done a lot of Ultra Marathons in the past, some of them over six days where I’ve covered over 175 miles. I’ve also done a lot of winter mountaineering in the French Alps, but this is my first water based challenge. Though the race isn’t until December this year, Alan is already raising money to get the boat ready for action which is currently hosted at 104 Battalion Royal Electrical Mechanical Engineers at its HQ at the Army Reserve Centre in Northampton. You can donate to Alan’s challenge via the Virgin Giving page. “The Atlantic Challenge is something I’ve wanted to do since I saw James Cracknell and Ben Fogle take it on in 2005/2006 – it’s a fairly unique, niche type of activity but is everything that a real adventure should be. Practical, emotional, technical and remorselessly physical."